Buster is our first ever dog and we knew the minute he arrived for his trial that he was in his furever home. We fell in love with his gentle nature from the start. He is a beautiful dog with so much love to give and is at his happiest when he is surrounded by his furever family snuggling on the couch or just sitting or sleeping (with his cute little snore) by your side. He also loves a good game of fetch much to the boy’s delight. Buster absolutely loves cuddles and tummy rubs from anyone who will give him one and enjoys a good brush each night after his dinner. He is also our alarm clock each morning. Buster loves to plant his wet nose on your face to wake us up then jumps up for his morning cuddle and tickles. His favourite things to do are his afternoon walk. He gets so excited the minute you reach for his lead. He is getting better around other dogs and has started dog obedience training to get him more socialized with other dogs. He also loves a ride in the car with the window down and his big fluffy ears flapping in the breeze. It doesn’t matter what sort of day you have had, Buster always brightens it up when you arrive home. He gets so excited to see us and he has this little routine that he does each time. He gives us all a cuddle then runs around the house 3 times and then runs outside and barks twice and falls back at our feet for more cuddles. 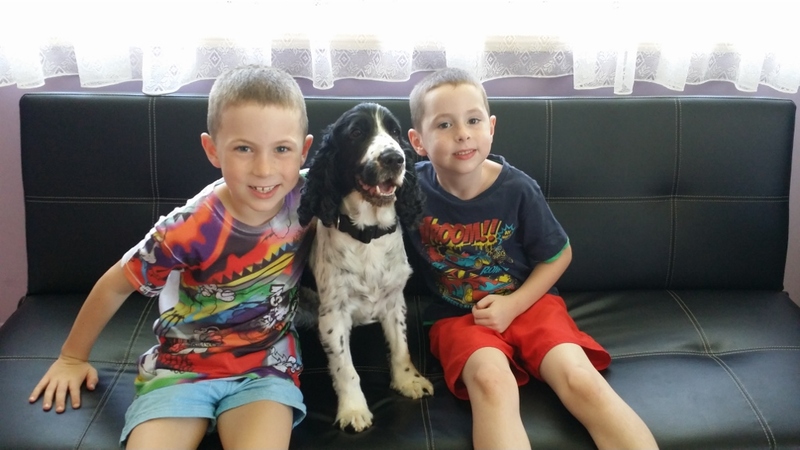 Thank you Cocker Spaniel Rescue Qld for allowing us the opportunity to adopt Buster. A special thank you to foster Mum Natasha for all her guidance and support. Noah said that getting Buster “is the best thing we have ever done” and he is right. We love him to bits and he has made our family complete. We promise to give Buster the loving home he deserves. Darrel, Tanya, Noah and Jonah.